With so many events and catch-ups with friends and family at this time of year we see the alcohol flowing and your weekly intake potentially becoming well above the recommended amount. Alcohol causes damages to the liver, which in turn has a direct impact on your skin. 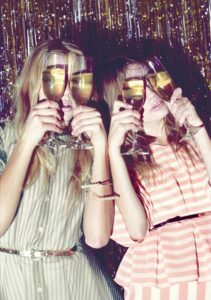 The most common affects of alcohol on the skin include dehydration (dry skin), breakouts, patchiness and enlarged pores. Alcohol also depletes the body of electrolytes and fluids, causing the skin to show signs of bloating and swelling. Avoid sugar: Sugar spikes your insulin levels which can cause acne and inflammation. It also contributes to cell damage and increased skin aging. The less sugar in your drink, the better for you. Try switching up the cocktail for a vodka, lime and soda. Stay hydrated: Drinking water is the best way to combat the dehydrating effects of alcohol. Make sure you are hydrated before your big event and have a glass of water in between drinks where you can. It may be the busiest time of year but it is still important to take the holiday period to rest and ensure you get enough sleep between your social events. Night time is when your skin repairs itself, and if you’re sacrificing sleep for nights out partying, it can result in dark circles and breakouts, as well as premature aging in the long term. Don’t overfill your social life: You may want to fill your holidays with social events and catch-ups with all your friends and family but it is important not to sacrifice your health. Limit your social calendar and schedule rest time for you. Take naps: With your days free, indulge in the childhood past time of napping. A short-term nap of 20-30 minutes is recommended to improve alertness without feeling tired afterwards. On average, Australians gain 0.8-1.5kg over Christmas, impacting overall health including your skin. Christmas is a time to indulge but don’t go overboard with high salt, fat and sugar foods if you want to keep your skin glowing. Choose healthier options: Christmas in Australia means we have a variety of delicious summer fruits to feast on instead of high sugar desserts. Swap the pudding for a fruit salad. Avoid going hungry to parties: Eat something light before the party to reduce your chances of overeating. Silicea is the perfect supplement to give your skin the support it needs to survive and thrive over the Christmas holidays. For more information visit www.silicea.com.au. Next Next post: New Year, fresh hair, skin and nails!